China has launched its second space lab, taking one step further in Beijing’s plan to establish a permanent space station. A Long March 2F rocket blasted off successfully at 10:04 p.m. local time Thursday (10:04 a.m. ET) from the Jiuquan Satellite Launch Center in the Gobi Desert carrying the lab known as Tiangong-2, which translates to “heavenly vessel,” according to state media China Central Television. A spacecraft will ferry a two-man crew to the lab in October — China’s first manned mission since 2013. The astronauts will remain in the lab for a month, where they will be carrying out experiments related to medicine, physics and biology. It’s China’s longest mission yet. 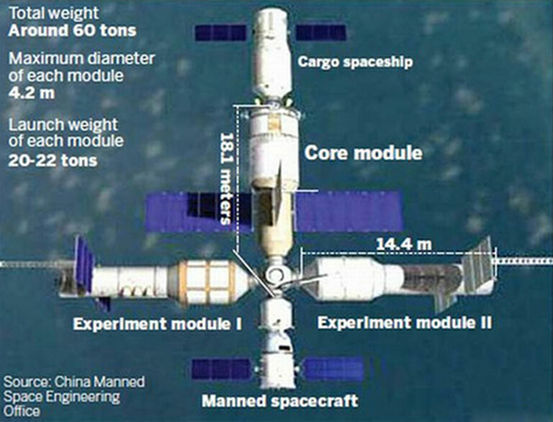 The Tiangong-2 and its predecessor, Tiangong-1, are prototypes for China’s ultimate goal — a permanent 20-ton space station, which is expected to launch after 2020. The advanced Chinese space lab is capable of monitoring physics in outer space, studying the behavior of microgravity and observing gamma rays. Reports say that the new Chinese space lab can observe and analyze a total of 10 gamma rays per year. To become the next super space giant, the Chinese Space Agency are launching one project after the other to prove their capability to dominate the space flight industry. The agency is all set to launch the second space lab Tiangong-2. The Long Mars 2F rocket will send Tiangong-2 to space. Both the space lab and the rocket have been positioned at the Jiuquan Satellite Launch Center and are ready to take flight. The docking of the rocket and the space lab aired live on China. Tiangong-2 is scheduled for launch sometime between Sept. 15 and 20, according to CCTV News. Tiangong-2 has the capability to observe gamma ray using its gamma-ray detector POLAR. POLAR is a joint project developed by the collaboration between China, Switzerland and Poland. But China’s ambitious plans don’t stop there. The agency plans a rendezvous with the new space station and Tianzhou-1, the first cargo and refueling spacecraft of China.